Check out our New Specials at Holston’s Kitchen in Morristown! As the seasons change and summer turns into fall, Holston’s Kitchen in Morristown introduces new specials to tantalize your taste buds all week long! No one can resist a tender, juicy prime rib, and on Wednesdays in Morristown, you can indulge in our Prime Rib Dinner for only $16.95! Thursdays are now Pasta Night at Holston’s! Enjoy your choice of pasta for only $10.99, served with a side salad and garlic bread. On the weekends, everyone loves a good burger, and the burgers at Holston’s are to-die-for! Come in on Friday nights from 8 p.m. to 11 p.m. and enjoy a burger and fries for only $5.99! This is a special deal worth bringing the entire family for. On Sunday, Sept. 23 be sure to join us after church for a delicious dinner! Show your Church Flier or Bulletin and receive 20% off. Stay up to date on all specials and promotions by following our social media! Enjoy Holston’s Specials in Morristown this Spring! Did you know Holston’s has some delicious specials throughout the week? Whether you want to enjoy Prime Rib Wednesday or Saturday Brunch, there is something for everyone at Holston’s in Morristown! We love Wednesdays because every Wednesday is Prime Rib Wednesday at Holston’s Kitchen. A thick, tender, flavorful cut of prime rib served with au jus sauce and your favorite side is ready for you at your hometown hotspot. Bring your special someone out for your weekly date night or celebrate a special occasion. Whether it be a casual night out or a memorable evening Holston’s prime rib night is a perfect choice. No reservations required, just stop in for a great meal and a wonderful dining experience. Just when you thought Saturday mornings could not get any better, Holston’s Kitchen introduces an all-new Brunch menu! Our Brunch menu offers both sweet and savory entrees. Try our Fried Chicken & Waffles or Quiche of the Moment! We also have Churro French Toast, the Waffle of Insane Greatness, our Signature Omelet plus much more. Bring out of town guests! Impress your in-laws! Or, simply relax and unwind from your week with delectable dishes! 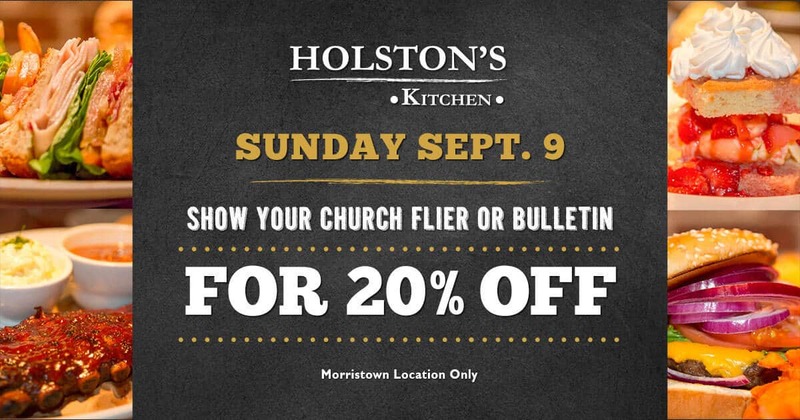 Every Saturday from 11 a.m. – 3 p.m.
Have a date night or a family night out at Holston’s Kitchen in Morristown. Grab the gang and head over to Holston’s Kitchen between 11 am – 3 pm for our Express Lunch menu Monday – Friday! We’ve got Homemade Meat Loaf, Signature Sandwiches, Chicken & Dumplings and more. With affordable prices and super fast service, there’s no reason why you can’t treat yourself and coworkers to an amazing lunch. Too pressed for time? Order Online for fast, fresh take-out service! Our slow roasted rotisserie chicken is a delicious meal you can pick up for the family on your way home from work! Build your perfect drink at the Bloody Mary Bar at Holston’s Kitchen in Morristown! Every Saturday and Sunday from 11 a.m. – 3 p.m. enjoy bold flavors and a fresh taste of a Bloody Mary crafted just the way you like. Start by choosing your favorite Vodka and Bloody Mary mix. Next, select your garnish. The bar is stocked with choices including fresh jalapeños, green olives, celery, fresh mozzarella, brown sugar bacon and more! Finally, pick your spice. Cajun seasoning, horseradish and smoked paprika rim are just a few that we offer. Did we mention our hot sauces: Sriracha, Tabasco & Cholula! Stay up to date on specials and promotions by following Holston’s Kitchen Sevierville. Why do we love Wednesdays, because every Wednesday is Prime Rib Wednesday at Holston’s Kitchen. A thick, tender, flavorful cut of prime rib served with au jus sauce and your favorite side is ready for you at your hometown hotspot. Bring your special someone out for your weekly date night or celebrate a special occasion. Whether it be a casual night out or a memorable evening Holston’s prime rib night is the perfect choice. No reservations required, just stop in for a great meal and a wonderful dining experience. If you decide to save room for dessert, may we suggest our classic Orange Soak Cake or Carrot Cake? Prime Rib Wednesdays is a tradition at Holston’s Kitchen in Morristown, TN & Sevierville, TN. Savor our mouth-watering rotisserie style chicken, it’s slow roasted to perfection. Join Us for Prime Rib Wednesdays! Be sure to check our bar specials and an extensive selection of wine and spirits.